The history of the fountain of youth starts somewhere before Ponce de Leon and has ended up somehow to a water fountain in Florida. 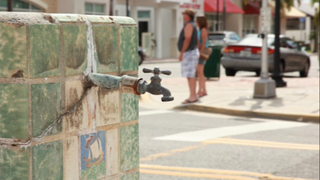 National Geographic tells a fascinating tale of how though one water fountain in Florida is radioactive, it may actually be extending the life of its drinkers. Located in the town of Punta Gorda, people have been claiming health benefits from the green-tiled fountain since 1896. During its most popular period, people would line up to drink from the fountain and the tap handle had to be replaced every six months. But in recent years, the city wanted to plug up the fountain and hook it up to city water because the fountain's radium levels was nearly double the recommended radium limit. But the citizens fought back and kept it open, even though the fountain water from the well is "heavy in sulfates, which give it a distinctive smell of rotten eggs". So radioactive and rotten eggs... how the heck can this water fountain be considered the fountain of youth? Well, apparently its because of its magnesium content. The fountain's water 46ppm of magnesium makes it more like mineral waters like San Pellegrino. And as most people are deficient in magnesium, the water fountain helps people get their fill. Apparently, multiple studies have shown that hundreds of thousands of death can be prevented a year if we just drank more magnesium in our water. If only Ponce de Leon knew.